The translation for pan de campo is "camp bread". It is just as often called cowboy bread. 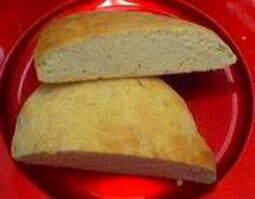 It is a simple baking powder bread that was a staple of the early Texans. It's still very popular today, and there are several pan de campo cook-offs in South Texas every year. I know a lot of you are thinking that sourdough was the bread of the cowboys. Well, if you had a chuck wagon and a cook to man it, sourdough was a real treat. But if you were eating out of your saddlebags, a jug of sourdough starter was a mite difficult to manage. The baking powder required to make pan de campo can be carried in an old snuff can if need be. Just as long as it's kept dry, it's happy. Flour, baking powder, salt, lard and some water is all that's required to make pan de campo. There are recipes that call for oil and milk, but that detracts from the basic nature of this bread. Cowboys on a trail drive were unlikely to have fresh milk handy, and they knew better than to try and milk a steer. The classic pan de campo is baked in a Dutch oven. It comes out as a round loaf the diameter of your Dutch oven and about an inch and a half or two inches thick. It can also be cooked in a skillet with a lid, or it can be fried. If things are really scarce, you can wrap the dough around a stick and cook it over coals. Oh, and if you are up-to-date, you can bake it in the oven in the comfort of your kitchen. Baking the pan de campo in a Dutch oven gives it a moist atmosphere to cook in, which I believe makes for moister bread. The "crust" will be soft. However, pan de campo baked in a dry oven will have a crisp crust which I like a lot. My favorite pan de campo is made into biscuit size rounds. I pat the dough out to about a half-inch thickness and cut it with a biscuit cutter. The finished product doubles in thickness. The ingredients used in pan de campo can stand some inspection. The main ingredient is flour. Most any all-purpose wheat flour will do. I prefer unbleached all-purpose flour. I just think it has a better flavor. It is also a little darker than the bleached flour. If you use whole wheat flour, it will not rise as well as regular flour. But you can mix half and half regular flour and whole wheat and get a good product. The shortening for the bread is also subject to debate. The original recipe would have used hog lard. Being that November is National Hog Lard Month, give it a try. The lard imparts very little flavor to the bread, and it does make for a moister end product. Some recipes call for oil such as canola or corn oils. The oils tend to separate in the mix and don't give as good a result to my way of thinking. The vegetable shortenings are good. My favorite for most baking is butter flavored Crisco. Baking powder is pretty much baking powder. Any brand name will do. Just make sure it's fairly fresh and hasn't come in contact with moisture. Regular table salt works in all recipes, as does granulated sugar or the baking style artificial sweeteners. As for water versus milk, you takes your pick. I don't think you would be able to tell the difference in the finished product. Time to check out a couple of recipes. The first comes from down in the Rio Grande Valley of Texas where pan de campo is very popular. Form into rounds and bake. (Here it's up to you as to the form of baking used, Dutch oven or conventional oven. Conventional oven should be about 350F degrees. Bake until golden brown. Note: the small amount of baking powder used indicates that the shortening will be relied upon to do the rising in the bread. The shortening goes through all kinds of processes with the flour to get steam pockets to form in the dough, which produces the "rise". If it doesn't rise enough to suit you, use about a big teaspoon of baking powder. This one has the oil. Add enough of the milk to make a stiff dough. Divide into four portions and form into rounds and bake. Work the flour in a half cup at a time until you get a thick dough that comes away from the sides of the bowl. Cover the bowl and let dough double in a warm place. This recipe will make enough for two 9x13-inch baking pans. Oil the pans before putting the dough in. No need for second rise, just pop in a 350F degree oven. You can refrigerate this dough, and it will last up to three weeks. No need to let it rise after you take it out of the ice box for use. Mix the dry ingredients in a large bowl. Cut in the shortening with pastry cutter until cornmeal like texture results. Add just enough water to get a thick dough that comes away from the sides of the bowl. Turn out on a floured surface and knead just until it comes together smoothly. 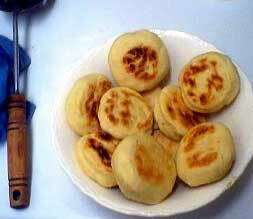 This recipe will make about a dozen biscuit-size portions or you can form the dough into one round no more than one inch thick. In a conventional oven, bake at 400 degrees until golden brown. None of the above recipes is written in stone. You can experiment with them until you get the perfect pan de campo. I had good success baking biscuit size "pans" in a cast iron skillet with a lid to cover the dough. I will bet you a pretty that an electric skillet would do a bang up job, too. You will have to turn the "biscuits" after the bottoms brown to get the tops to brown this way. I would start with a setting of about 350F degrees. Now that you have a house full of pan de campo, it's time to lay in some cream gravy and butter and jelly.